Savasana (shah-VAH-suh-nuh) is a pose that takes us to the next level of our practice, which is pranayama. This pose teaches us to keep the spine elongated while reclining and cultivates stillness. The physical and the mental body are trained to be quiet in this pose. In a good yoga practice, the entire body is stretched, contracted, twisted and even inverted. The only thing left to do is to completely relax the body. Muscles that may have been tense are allowed to relax, thereby releasing any unnecessary tension they were exerting on other structures such as the bones, nerves and joints. In this state of relaxation, the heart rate and breathing slow down, which also helps in reducing blood pressure. 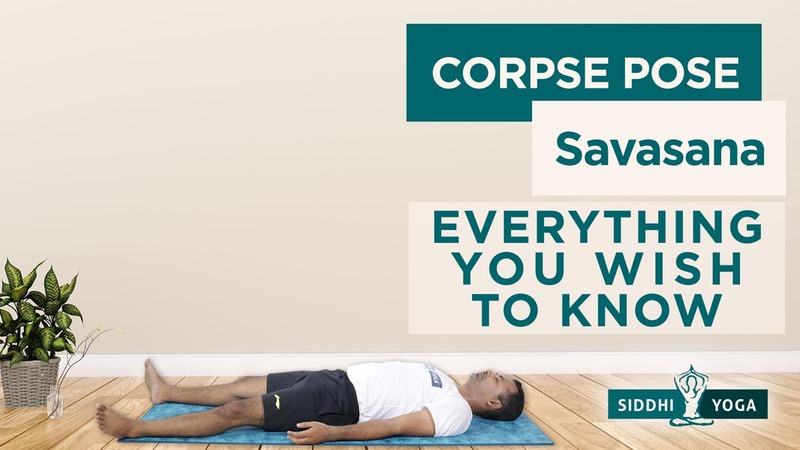 Therefore, Savasana is a good pose for all and should not be skipped. Savasana is a pose of complete relaxation. What do we mean by relaxation? To relax is not to collapse, but undo all the tensions that we have accumulated in the body and mind. We have educated the body to be constantly doing and achieving until a point where we believe that without doing we have not achieved anything. Or have we questioned ourselves about what is it that we are constantly trying to achieve, and why trying to achieve has made us become so tired and stressed. Tensions are just the result of will and effort. We have been trained from very early on in our lives to struggle to achieve. Our life just passes on by while we are trying to climb the stairs of achievements that take us away from who we really are. What are we looking for? We are all looking for “GOODNESS.” We may call this peace, love or joy but the foundation of all those emotions is to feel good. Nobody wants to feel bad. But it seems we can’t reach this goodness. Goodness is not to be achieved, but it is to be understood as our own true nature. Our true identity. All that we want is to feel good and we are looking for this in the wrong direction. The direction is not out there, it is in here and now. Goodness is not to be achieved by any action but to be realized as our own true nature. Not doing but knowing. It is just as simple as knowing yourself; you do not need any introductions to yourself. Now we have to learn to let go and undo and work in the opposite direction. Undoing is not an action, but just letting things fall or leave as we focus on the inner self, which is the goodness within. Let it all release in Savasana. It is not a state of passivity but an alert watchfulness. Undo and relax the body and mind from all the achievements we have and all the concepts we have built. Just remain and be. Savasana is the entry to pranayama and pratyahara. Those with back issues can do the pose with a bolster under their knees. Those with a reverse curve in their necks should place a small rolled blanket under the neck. The body should be warm in Savasana. If the environment is cold, cover the body with a blanket. Keep the room dark or cover the eyes with an eye bag or bandage. I loved this video. As a person with special muscle and join tissues (basically abnormal collagen by birth) I am unable to exercise. At 60 I have been through a great journey to understand my health. During the process doctors have further damaged my health with constant physiotherapy. This is not to blame them, they have done the best they can. I have met some wonderfully human, compassionate doctors and therapists along the Course of my journey. At the moment, they are the ones who have diagnosed my problem and offered clues to next steps. I have understood clearly that my body cannot tolerate exercise. Even sustaining a 15 minute daily walk program is a challenge. and up until now, cannot breathe very well and therefore avoided yoga too.My father practiced yoga and I am aware of its benefits, but did not know how to proceed with it, as most practitioners, and even relatives and ordinary people around me do not understand my issues.It was while reading a book that I came upon the concept that yoga emphasise stillness rather than active agitation of the body. I found it fascinating, and realised immediately that this was the solution I was looking for. Now I a much better, and ready to consider yogic breathing. During the course of my research, mainly by reading and browsing, it struck me that possibly, along with breathing, shavasana is a very good start for my journey into yoga. I would love to know if you sell videos to coach students, or whether you can assign a guide to work with me online (I live in Singapore) Do you have teachers certified by you in Singapore, and in Chennai India? What I love about this video is the special attention you have accorded to just the act of getting into and out of the pose. I have both the problems you mention in the video. Want more where this came from? Sign up for our newsletter. Want to become a registered yoga teacher but don't know where or how to start? We seek to resurrect the lost art of life balance: mental, spiritual and physical. To impart teachings within our communities that foster optimal health from body to soul. To help our students find harmony with nature, reclaim their life’s natural balance and cultivate peace of mind.